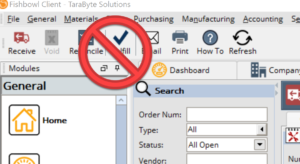 Like many things in Fishbowl (and life), when it comes to receiving and reconciling the receipt of inventory against the vendor bill, there’s a right way to do things and a wrong way to do things. Follow the right way to receive, and life in Fishbowl/QuickBooks–land is joyful and wonderful. Do things the wrong way, and things can get ugly. 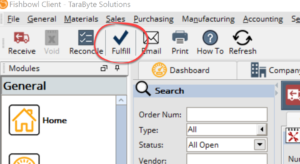 After receiving inventory into Fishbowl, many people assume that the next step is to hit that button and complete the process of “fulfilling” the order. All I can say is, “NOOOO! DON’T DO IT!! 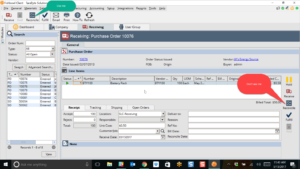 !” Because once you press that button, you eliminate the ability for accounting to do any reconciliation of this order at all. This is such a big issue that you need to take action to prevent it from ever happening. Customize your user permissions in Fishbowl to ensure that absolutely no one in the company—including the CFO—can push that button. To do this, go to the user rights area within the user group, and uncheck the “receiving-fulfillment” box. 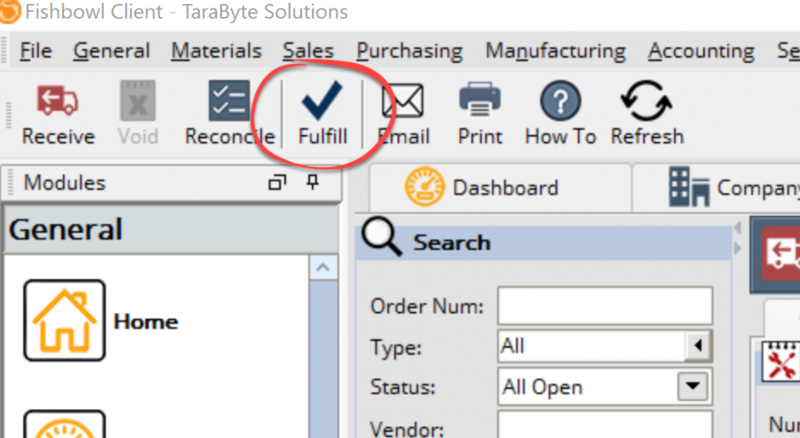 Create a special User Group for reconciling. This User Group should be the only one with reconciliation rights. Assign all of the people in accounting who need to be able to do reconciliations to this User Group. Use the correct “Reconcile” button. Just to make things more interesting, there are two different “reconcile” buttons within Fishbowl. Always use the big button that’s at the top left of the receiving screen. Never use the button that’s to the right of the detail item. What happens if you use the wrong button? 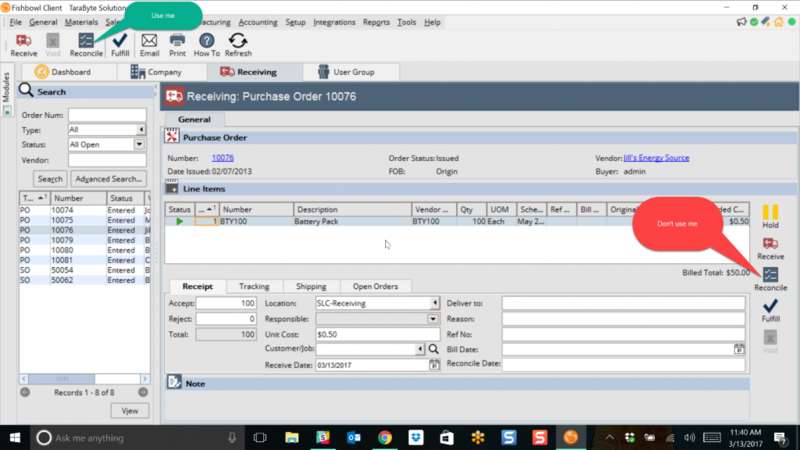 The “Reconcile” button that’s to the right of the detail item will fulfill the order without giving you the opportunity to add freight,landed costs or the vendor’s invoice number to the bill. 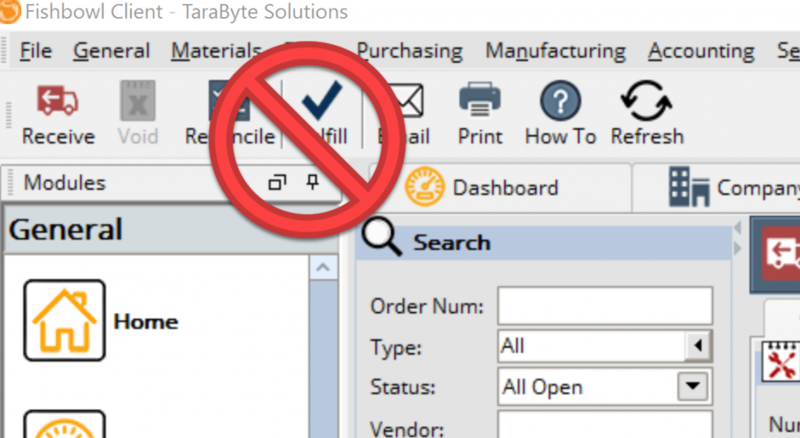 Force your vendors to bill you. As I explained in my article on this topic, getting your bills in so that you can reconcile them to your item receipts in a timely manner is critical. What if your payables folks are worried that doing this will cause them to not pay the bills on time? No problem. Simply change the bill’s due date. 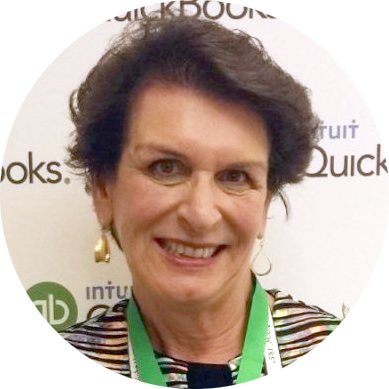 Need help evaluating whether or not you’re doing things right in your Fishbowl/QuickBooks environment? Give me a call. As a Fishbowl Super Hero, I can evaluate your processes for you.